Click here for an order blank for discounted classroom sets. "Excellent Resource" – rating in InfoTech, the materials selection guide from the Instructional Technology Division of the North Carolina Department of Public Instruction. "Excellent Resource" – rating in EvaluTech the online guide from the Southern Regional Education Board's Educational Technology Cooperative and the Educational Resources Evaluation Services of the (NCDPI), in collaboration with the departments of education of the other SREB states, including Alabama, Arkansas, Delaware, Florida, Georgia, Kentucky, Louisiana, Maryland, Mississippi, Oklahoma, South Carolina, Tennessee, Texas, Virginia and West Virginia. 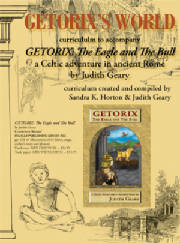 Curriculum materials are available for the Roman Republic and the novel Getorix: The Eagle and The Bull, by Judith Geary. A more complete 98 page curriculum, Getorix's World by Sandra Horton and Judith Geary, related to the novel and with activities and essays about the Roman Republic is available separately or included with a classroom set. An "Accelerated Reader" test for Getorix: The Eagle and The Bull is available from Renaissance Learning at the link below. Getorix: The Eagle and The Bull is lexiled by Metametrix at 920. Click here for a Power Point presentation with images of Roman sites and instructions for draping a toga.